This entry was posted on மே 24, 2013 at 5:22 முப and is filed under அறுவை சிகிச்சை, இதயமாற்றம், இதயமாற்று, இதயம், ஏற்காது, ஏற்பதற்றது, ஏற்பு, ஏற்புடையது, பொருந்தாது, பொருந்தும், மருத்துவமனை, மலர், மலர் ஹாஸ்பிடல், மௌலானா, ஹராம், ஹலால். You can follow any responses to this entry through the RSS 2.0 feed. You can leave a response, or trackback from your own site. See photo in the main blog as above. 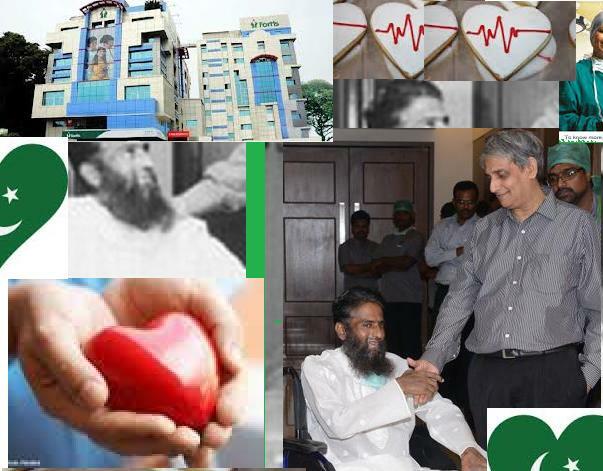 When Moulana Mohammed Zubair Ashmi’s heart grew large, literally, and failed him, it was another large heart that replaced it. If hearts have nationalities, then the first was Pakistani, and the second, Indian. The 51-year-old Pakistani religious teacher was diagnosed with a condition called ‘dilated cardiomyopathy’ where the heart is enlarged, becomes weakened and is unable to function well. Doctors had told him that his only option was a heart transplant. “There is no facility for a transplant back home,” he says over video, still not completely up to hobnobbing with media persons. His folks did a search and contacted K.R.Balakrishnan, director, Cardiac Sciences, Fortis Malar Hospital, here. He was critically ill even as he was flown to Chennai via Dubai from Lahore.To make matters worse, he was Hepatitis C positive. Though he spent about two months in the ICU at the hospital, Ashmi’s condition continued to deteriorate. Doctors had to find a donor heart for him or put him on an artificial implant device. It turns out a donor became available in March. The family of a 37-year-old man who had met with a road accident and been declared brain dead, came forward to donate the organs. “Even if there had been a delay of two days, we would have lost him,” says Suresh Rao, chief, Cardiac Anaesthesia and Critical Care, Fortis Malar. He goes on to explain that though the donor and recipient were of two different blood groups, the tissue mapping showed a good and viable match. Pre- and post-transplant, Ashmi’s Hepatitis C viral load had to be brought down, the kidney damage managed, and immuno suppressant therapy had to be modified to suit the patient, Dr. Rao explains. Traditional immuno suppressants affect the liver, and with an existing hepatitis C infection, extra care had to be paid to that, Dr. Balakrishnan adds. “It is good government policy in Tamil Nadu that has facilitated a man from Pakistan to get a heart from Chennai. Goes to show that good policies have a major impact on promoting good health, not only locally, but globally too,” he says, further. Maulana Ashmi is weak, but has gone back to talking at length. He would like to go home, to his family (his wife could not accompany him as she was denied a visa) and back to teaching in his mosque. In a fight against odds that was successful, a Pakistani madrassa teacher now has a heart that belonged to a Madrasi. Turns out, they couldn’t, as even air ambulances aren’t cleared to fly across the Indo-Pak border. After speaking to the Ministry of External Affairs, they managed to convince them to permit him a single-city visit visa, “Because of that, he flew on a passenger plane from Lahore to Dubai and then to Chennai. When he got here, he was unconscious,” the doctor adds. As Zubair had intense cardiomyopathy, doctors realised that his only hope was to put him on the transplant list immediately. “The doctors called me on April 24 and told me that they had got a heart, and I was overjoyed,” says Zubair’s brother-in-law who came with him. His celebrations were cut short when he was told that the donor’s blood group (O) was a mismatch for Zubair (AB+). The heart of a 36-year-old accident victim from Chennai now beats in the chest of a Pakistani, who narrowly escaped the claws of death. 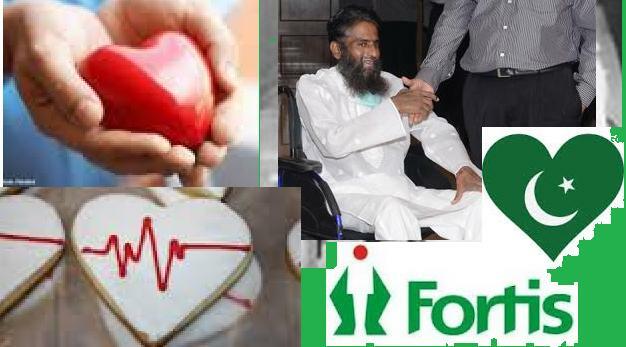 In a rare occurrence, the Pakistani managed to fly across, get admitted to a hospital in Chennai and receive a donor heart a day or two before doctors at Fortis Malar Hospital would have given up on his ailing body. Moulana Mohammed Zubair Ashmi (41), a teacher at a madrassa in the small town of Tehsil Kharian (Gujarat district of Pakistan), had a heart that was pumping blood with only 10 per cent efficiency — well below the average 60 per cent required. In addition, his kidneys were shutting down and his urine output was minimal, apart from which his liver was ravaged by Hepatitis C.
“I don’t think I would have made it, really,” admits the thin, bearded man candidly, looking back on his near-death experience. “Inshallah, I am here now,” he adds in Urdu-tinted Hindi. 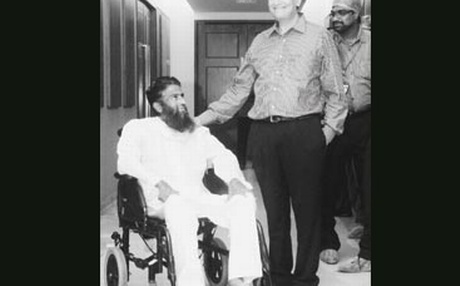 Though his doctors in Lahore agreed they could do little for him surgically, they made the long-distance call to Dr K R Balakrishnan, in Chennai, that saved his life.A long process ensued to get Zubair to Chennai, after which several medical obstacles were overcome to give him his new heart. Zubair is recovering remarkably fast. Expected to return to Pakistan in a month, he says he feels just as much at home here in Chennai. “There is no difference between India and Pakistan… They love me a lot more here, since I am Pakistani,” he says. 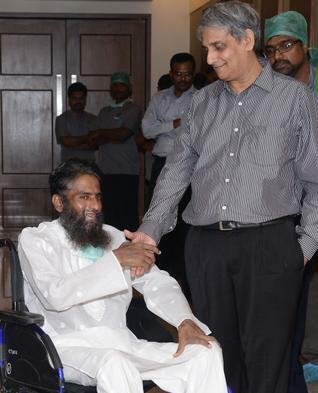 Chennai, May 23 : For 40-year-old Moulana Mohammed Zubair Ashmi, a lecturer from Gujarat district of Pakistan, it was a rebirth as he successfully underwent a complex heart transplant surgery at a city hospital. 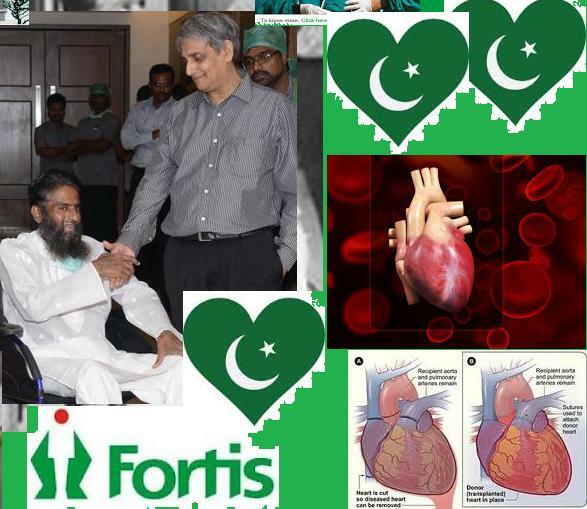 The successful transplant wherein the heart of a brain dead patient of Indian, was harvested and transplanted on the Pakistani national was performed by a team of doctors at the Fortis Malar Hospital here. Since 2010, when he was diagnosed of Jaundice that led to liver problems, life was not the same for the Lecturer as he developed breathing problems, poor urine output and swelling in the body and was repeatedly admitted to hospitals. Renal failure and fluid in lungs and abdomen coupled with Hepatitis-C positive, made the heart transplant more complex and challenging. He was suffering from a complex condition called ‘Dilated Cardiomyopthy’, wherein the functioning of both the ventricles of the heart was severely depressed. Ever since he underwent an angiogram in Pakistan about a year back, he had been on medication as he was diagnosed with decreased pumping efficiency of the heart of around 10 to 15 per cent (normal being 60 per cent)–a condition that denoted his poor heart function. His condition became very critical and the doctors in Pakistan gave up any hope of his survival. It was at this critical stage, Ashmi’s relatives heard of Fortis Malar Hospital at Chennai in India and contacted its Cardiac Sciences Director and Chief Consultant Cardiothoracic Surgeon Dr K R Balakrishnan, who gave the family a ray of hope. When all hope was lost, faith led him to cross the border when he was airlifted from a leading heart hospital in Lahore to Fortis in March. Talking to reporters here today, Dr Balakrishnan, Critical Care Specialist Dr K G Suresh Rao and his team of doctors said when he was brought to the Fortis Malar Hospital his condition made them extremely difficult to treat. Dr Balakrishnan said despite being on maximal drugs, his cardiac function was deteriorating, though he was in Intensive Critical Care Unit for more than two months. As his kidneys were nearing ‘shut down’ with a serum creatinine of about 3.8 mg per cent (normal less than 1 mg per cent), and the urine output scanty (less than 150cc per day), doctors were left with the option of either finding a donor heart urgently or fitting him with an artificial implant device. ‘Since his right ventricle became dysfunctional, long term artificial heart pump support was ruled out. He was put on advanced heart failure treatment and waitlisted for transplant (average waiting period is three months)’, Dr Balakrishnan said. ‘His blood group was the rare AB positive and finding a matching donor is a herculean task. We thought Ashmi cannot survive even the next one or two days,’ he said. Luckily for Ashmi, the two-month-long wait appeared to be over when the doctors got a call from a private hospital about a brain dead person and the family being ready to donate the heart, thanks to the highly efficient organ sharing network system put in place by the Tamil Nadu Government. But the donor’s blood group was ‘O’ positive, which was a universal donor. The doctors agreed to go for the cross match because of his condition as any delay in transplant would have cost him his life. The team of doctors modified the immuno suppressants to overcome the incompatible blood group and performed the transplant on April 21 as the tissue matching was good and viable. The Hepatitis-C was treated with Interferon, thereby reducing the viral load. The renal diseases were managed with inotropes to increase the renal blood flow. The transplant was successful and his body weight came down from 54 kg (before transplant) to 36 kg as all the fluids in lungs and abdomen were removed. He was put under proper medication and the post-operative recovery was smooth. Today Ashmi, who was introduced to the media after the press conference, said, “I crossed borders with faith and travelled more than 2,500 kms. Chennai gave me a rare gift of life.” “I am ready to live life all over again…it is due to the kindness of my saviour heart. I Love India,” Ashmi said. He would soon be discharged and Ashmi is all set to take up his favourite job : Lecturer in a mosque. Ashmi’s brother-in-law Jamil Ur Rehman Hasmi, who was all through with him in hospital for the last two months since he was airlifted on March 10, hailed the effort of Indian doctors in giving a new lease of life to Ashmi. “People of India and Pakistan are same. There is no difference in culture…no difference in people, city and traffic. There is no difference in anything. Before Independence it was one nation called Hindustan. Later it became Pakistan and Hindustan, but we feel the same,” he said, in an emotional tone.